This week, as we turn the corner towards Christmas, you may be struggling to find gifts for some of the people on your list. If so, think GREEN – greener gifts, that is. Check out the suggestions below to both generate great gift ideas and to be kind to the planet in the process. 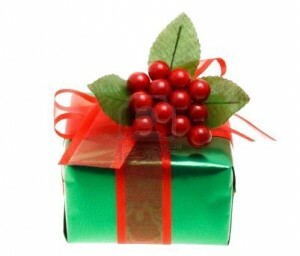 Think “greener” when giving and presenting gifts! Or you may choose not to give “things” at all. Instead of giving “stuff,” think of giving or sharing experiences. Depending on the recipient, this may be a weekend together away, a gift certificate for a massage for your massage-fiend friend, or a meal at a favorite restaurant. A gift of time is priceless. Another win-win gift is to make a donation in someone’s name. Rather than buying that 16th sweater for the person who already has everything, donate to that person’s favorite cause, or introduce them to yours. Whether it’s to a medical cause or a favorite charity, there are endless ways to make the world a better place. Not the least of which is the Sustany® Foundation! Your donation to Sustany® goes to programs in Tampa Bay that directly improve the environment (like beach cleanups) and that raise awareness of the importance of sustainable practices (like the Sustainable Business Awards). Think about ways to minimize packaging: that includes boxes, bags, wrapping paper, ribbons, tags, and anything else that typically lands in the trash just minutes after the gift is opened. If you have a pyramid of boxes from Amazon, consider just using them as-is, rather than opening them and wrapping the gifts again. The recipient can’t see what’s inside, so the element of surprise is maintained! If you do wrap gifts, look for wrapping paper made from recycled paper. You can also press old Sunday comics into service for a colorful and unique presentation. For kids, consider hiding the gifts rather than wrapping them. When our daughter was little, my husband drew small pictures as clues for her to follow around the house leading to her gifts. She enjoyed the anticipation of the “hunt” as well as the gift itself. Once everything has been opened and cleanup begins, don’t throw all that packaging into the trash. Recycle paper and boxes if you can. Save holiday-themed boxes and bags to reuse next year. Donate excess food to a food bank, tempt you work colleagues with it, or send your holiday guests home with delicious doggy bags. So if you’re up against it in buying gifts, don’t despair! Think green, and you may discover that you’ve actually saved the best gifts for last. Click here to donate to Sustany® in someone’s name – and THANK YOU!